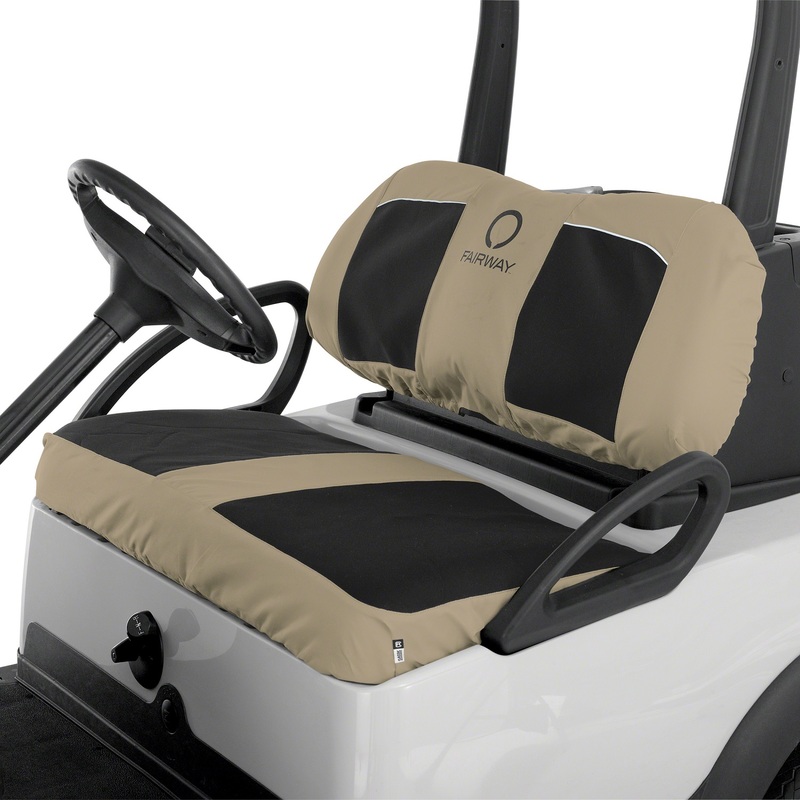 The Terry Cloth Golf Seat Saver by Classic Accessories extends the life of your golf car seat by protecting against dirt, sun damage and wear. The soft terry cloth fabric is comfortable against the skin and protects from heat or cold. The stretch fabric creates a custom like fit. Elastic hem and strap system provide a custom like fit and is machine washable. Vintage Concepts created a set of uniquely designed and hand painted bottle stoppers to provide a fun and unique way to preserve that special bottle. Solid pewter bottle stopper which fits standard 750 ml bottles and most other Bottles. Stainless steel cone with rubber gasket creates the perfect seal on the bottle. 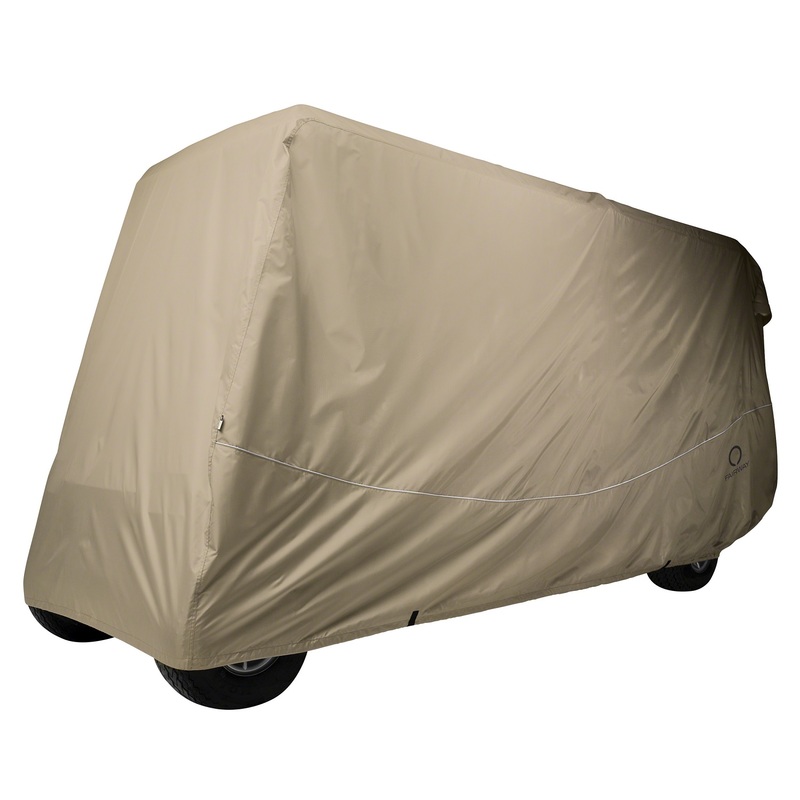 Golf Car Quick-Fit Short Roof Cover protects golf cars from sun, weather damage and dirt. The weather Protected fabric won't shrink or stretch. Elastic cord in bottom hem for a custom fit. Rear zipper for easy entry and installation and rear air vents reduce wind lofting and inside moisture. Water-repellent fabric with reflective piping and tie-down straps to prevent blow off. Integrated storage bag. 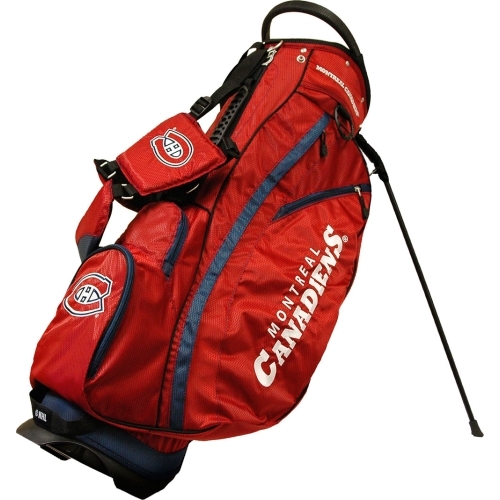 Fits most two-person golf cars (up to 60" L roof) Materials: 100% woven polyester. Classic Accessories Neoprene Paneled Seat Covers (Black and Khaki) unique fabric resists shrinking and stretching. The Fairway collection features a near-perfect fit on universal covers and enclosures. The Paneled Seat Covers features: Gardelle fabric won't shrink or stretch, durable water-resistant fabric. Extends the life of your seats and also protects against dirt, sun damage and wear. Covers and renews older or damaged seats. Reflective piping for added visibility. Elastic hem and strap system provide a custom like fit. Fits most golf cart seats in minutes. Machine washable. Classic Accessories Neoprene Paneled Seat Covers (Black and Navy) unique fabric resists shrinking and stretching. The Fairway collection features a near-perfect fit on universal covers and enclosures. The Paneled Seat Covers features: Gardelle fabric won't shrink or stretch, durable water-resistant fabric. Extends the life of your seats and also protects against dirt, sun damage and wear. Covers and renews older or damaged seats. Reflective piping for added visibility. Elastic hem and strap system provide a custom like fit. Fits most golf cart seats in minutes. Machine washable. 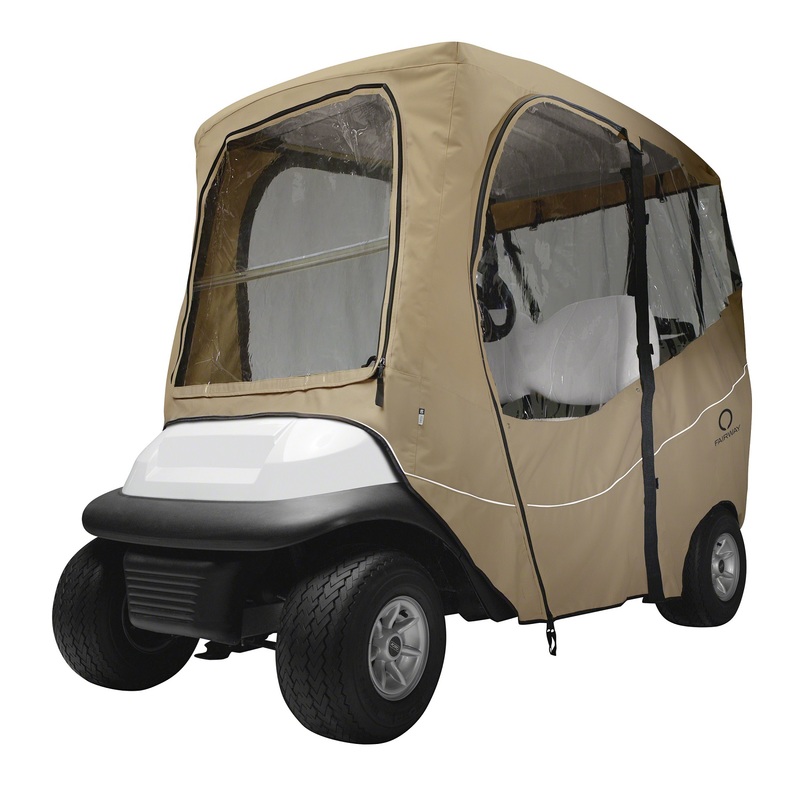 The Fairway Golf Cart Quick-Fit Cover will fit an extra long roof up to 124" L roof. This cover has rear air vents to reduce wind lofting and inside moisture, and an elasticized cord in the bottom hem for a customized fit. 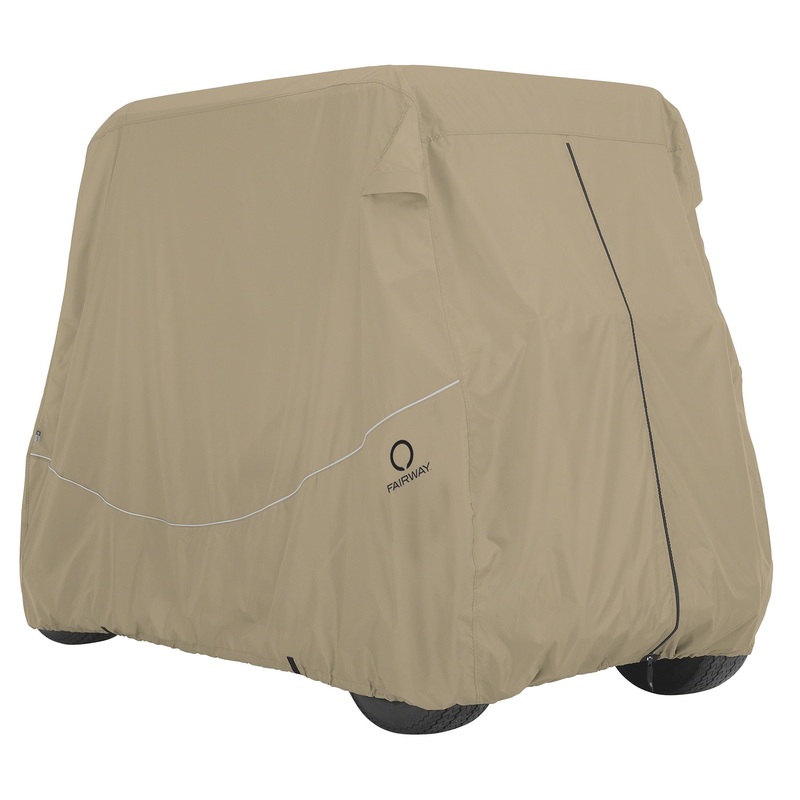 Made of tough fabric, this golf cart cover won't shrink or stretch and has water-repellent fabric, thus giving you a long term usage despite weather conditions. The rear zipper give you easy entry and installation. Tie-down straps prevent blow off and comes with an integrated storage bag. The Club Utility Lock is great for securing golf carts, ATV's, scaffolding, ladders, gates, patio furniture, garden tools, power tools, trailers, motorcycles and thousands of other items. 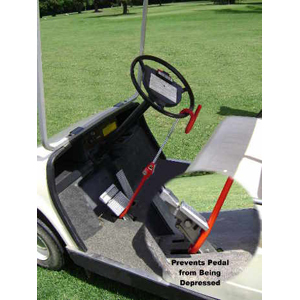 To secure your golf cart, simply attach the utility lock from the steering wheel to the roof post. If a thief can't steer it, he can't drive it, thus preventing theft. Length adjusts from 13 3/4 inches up to 20 1/4 inches. 6 1/4 " Wide. 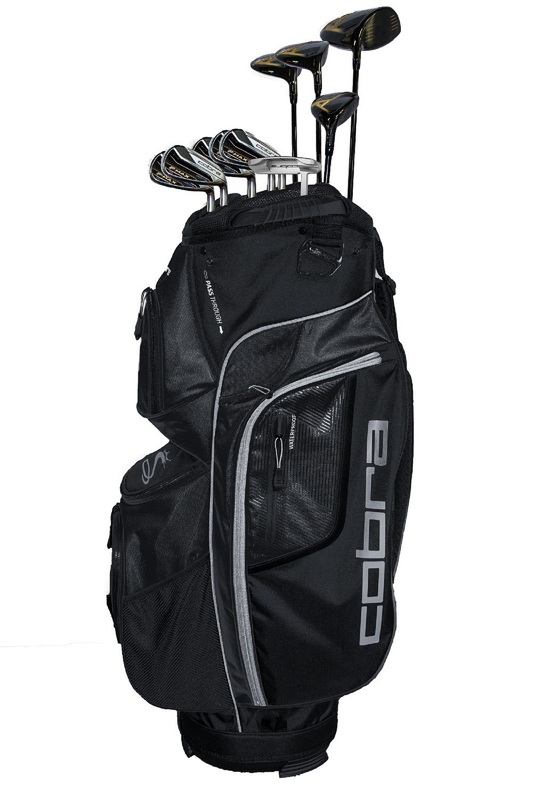 Your best golf is yet to come with the Cobra F-Max Complete light/senior Set, which includes a full set of easy to hit F-Max clubs and a full-feature cart bag. Featuring a driver, 3 wood, 4 hybrid, 5 SW irons, and blade putter this set combines of all of the 2018 Cobra technology into one package. 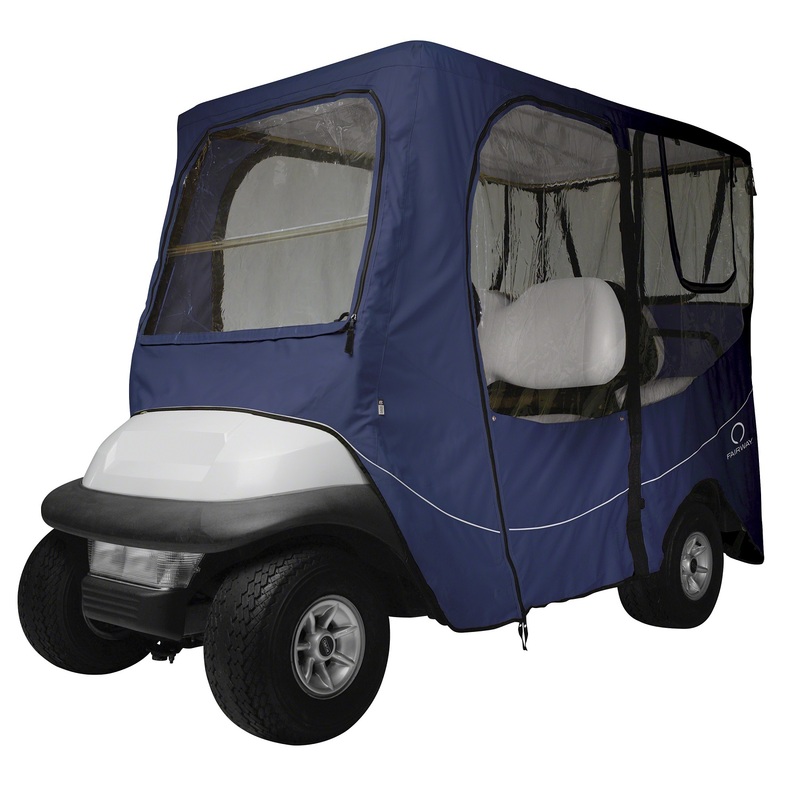 FadeSafe E-Z-GO Golf Car Enclosure (Navy) contains FadeSafe solution-dyed fabric that significantly reduces sun bleaching. Has full protection against weather and wind and fits over roof and secures with hooks on bottom. Quick zip-off windshield stores in front pocket which keeps golf cars clean and dry. The super-clear window material with heavy-duty polyester walls and top Zippered doors and panels adjust quickly and easily to any weather condition. Doors can be rolled back or completely removed. Windshield bumper access points and interior and exterior zipper pulls for quick and easy access. Reflective piping for enhanced safety and convenient carrying duffle bag with padded handles included. Fits E-Z-GO TXT and RXV two-person golf cars. Materials: 60% woven polyester with PVC backing, 40% PVC. Dimensions: 81"L x 45"W x 65"H; Weight: 13.7 lbs. Classic Accessories Diamond Air Mesh Seat Covers (Black), protects new seats or renews the look of old ones! The Fairway Golf collection features a near-perfect fit on universal covers and enclosures. This seat cover features: Unique diamond mesh weave allows air circulation, adds comfort and creates a technical, sporty look. The stretch fabric creates a custom like fit and extends the life of your seats. Also protects against dirt, sun damage and wear. Elastic hem and strap system provide a custom like fit. Fits most golf cart seats in minutes. Machine washable. The Fairway Golf Cart Quick-Fit Cover will fit a short roof up to 60" L roof. This cover has rear air vents to reduce wind lofting and inside moisture, and an elasticized cord in the bottom hem for a customized fit. 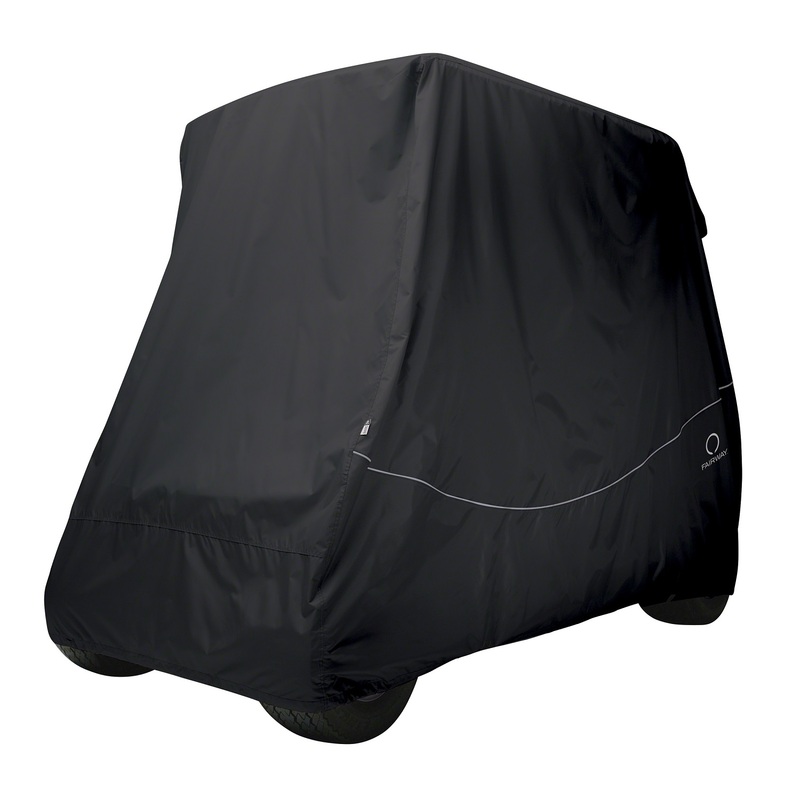 Made of tough fabric, this golf cart cover won't shrink or stretch and has water-repellent fabric, thus giving you a long term usage despite weather conditions. The rear zipper give you easy entry and installation. Tie-down straps prevent blow off and comes with an integrated storage bag. The Cobra Women's F-Max Complete Set includes a full set of easy to hit F-Max clubs and a full-feature cart bag. Featuring a driver, 3-wood, 5-wood, 4 hybrid, 5 sw irons, and blade putter, this set combines all of the 2018 Cobra F-Max technology into one package. Whether you are seeking protection from unguided golf balls or inclement weather, the Fairway Deluxe Enclosure (Navy) fits a long roof up to 80 inches. The Gardelle fabric won't shrink or stretch and the reflective piping for enhanced visibility in low light. Doors and windows roll open and secure with rip-n-grip straps. 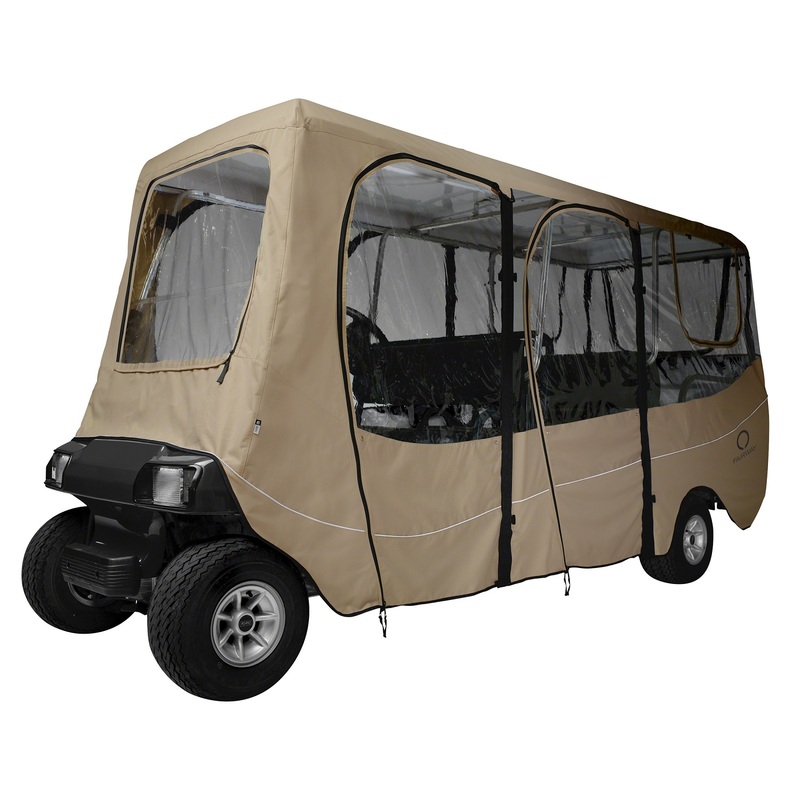 With a quick zip off windshield and zippered doors and panels adjust quickly and easily to any weather condition. Interior and exterior zipper pulls make for a quick and easy access. The convenient carry duffle bag with padded handles makes an easy transport just a zip away. And because it can double as a Storage Cover during the off season, this Enclosure really makes itself useful year - round. 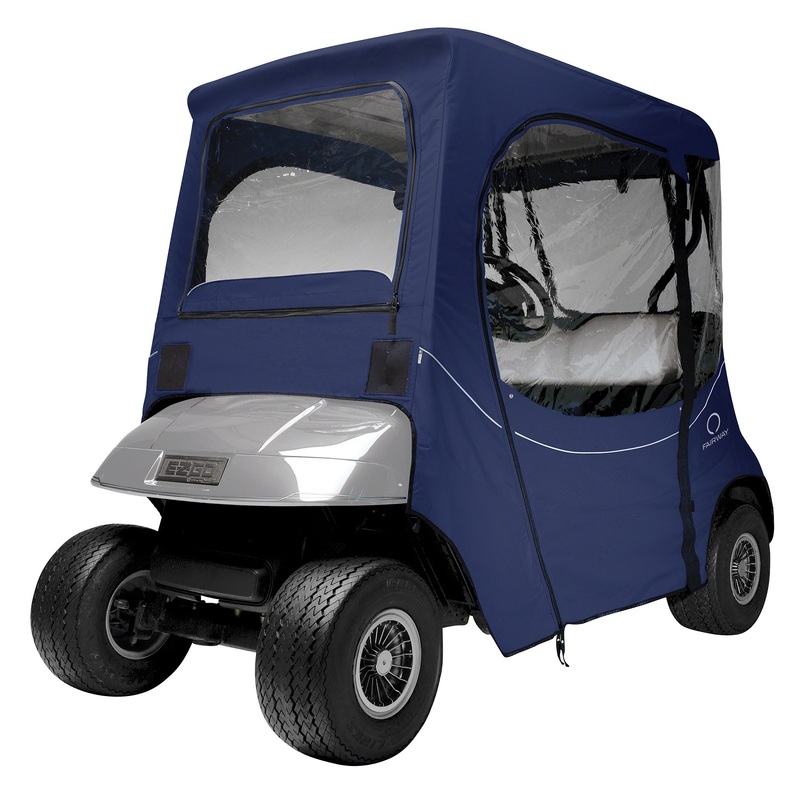 Golf Car Quick-Fit Short Roof Cover (Navy), protects golf cars from sun, weather damage and dirt. The weather Protected fabric won't shrink or stretch and elastic cord in bottom hem for a custom fit. 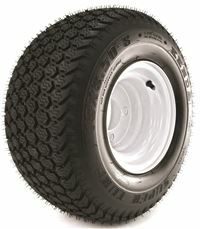 Rear zipper for easy entry and installation with rear air vents reduce wind lofting and inside moisture. Water-repellent fabric has reflective piping and tie-down straps to prevent blow off. Integrated storage bag Fits most two-person golf cars (up to 124" L roof). 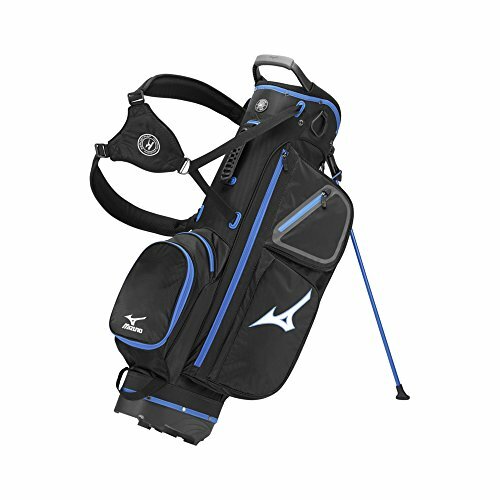 The Mizuno Pro Stand Bag is redesigned with the latest features and functionality so you can look and feel like your favorite pros. 14 - way dividers so you can keep all your clubs separate. A channel for cart strap and a rain hood included. 6 functional pockets including 1 magnetic, 1 lined for valuables and 1 insulated drink pouch. Classic Accessories Diamond Air Mesh Seat Covers (Navy), protects new seats or renews the look of old ones! The Fairway Golf collection features a near-perfect fit on universal covers and enclosures. This seat cover features: Unique diamond mesh weave allows air circulation, adds comfort and creates a technical, sporty look. The stretch fabric creates a custom like fit and extends the life of your seats. Also protects against dirt, sun damage and wear. Elastic hem and strap system provide a custom like fit. 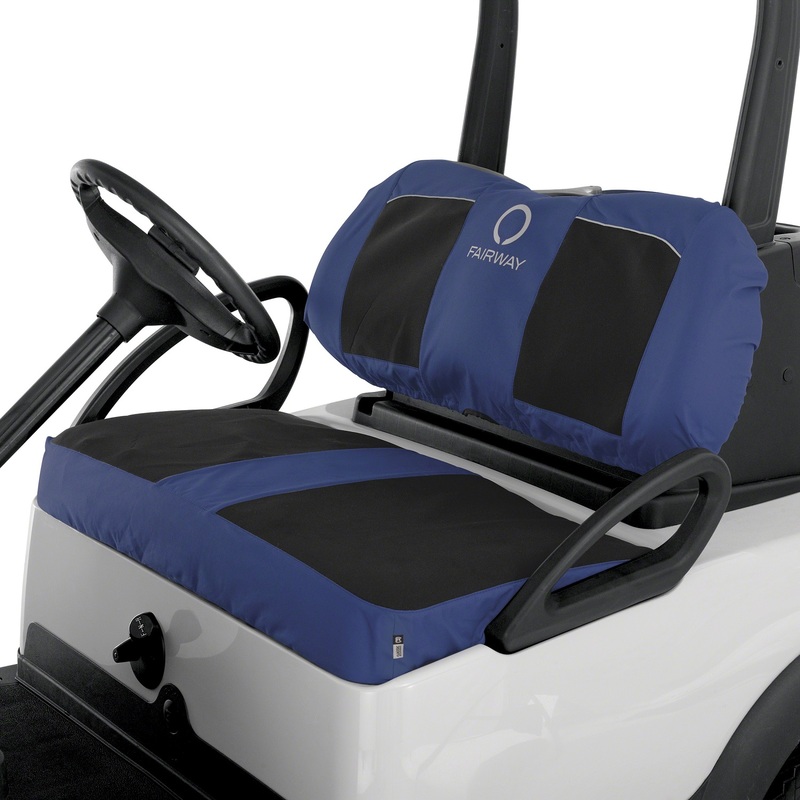 Fits most golf cart seats in minutes. Machine washable. 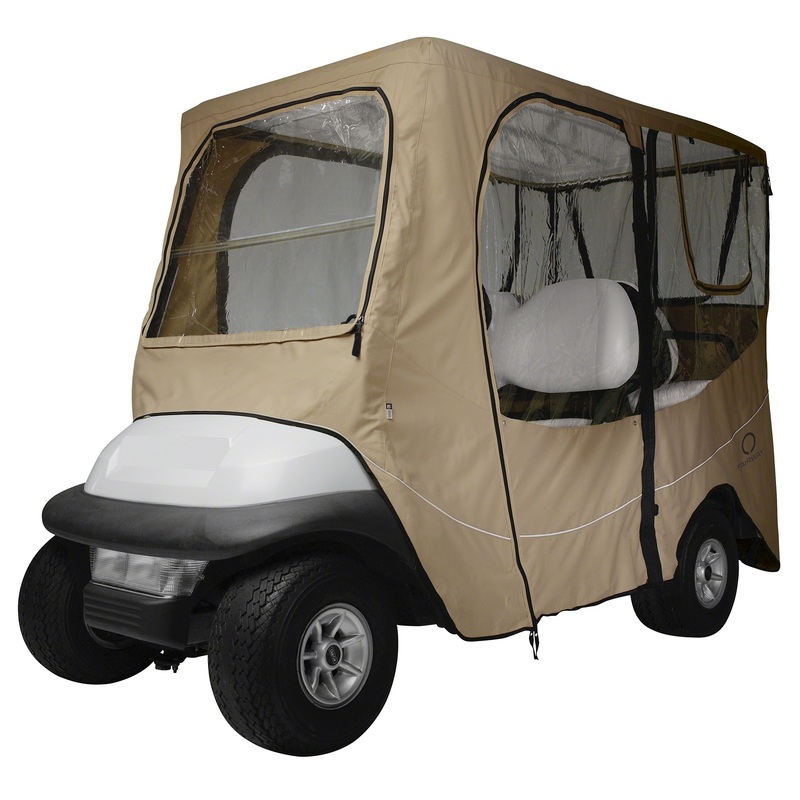 The Fairway Golf Cart Quick-Fit Cover will fit a long roof up to 80" L roof. This cover has rear air vents to reduce wind lofting and inside moisture, and an elasticized cord in the bottom hem for a customized fit. 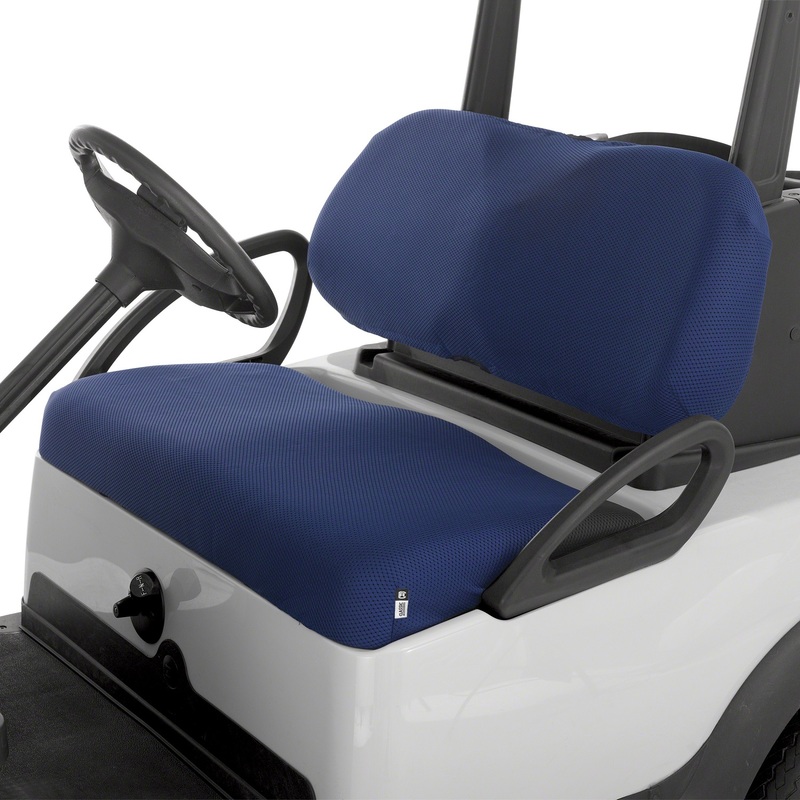 Made of tough fabric, this golf cart cover won't shrink or stretch and has water-repellent fabric, thus giving you a long term usage despite weather conditions. The rear zipper give you easy entry and installation. Tie-down straps prevent blow off and comes with an integrated storage bag. Whether you are seeking protection from unguided golf balls or inclement weather, the Fairway Deluxe Enclosure (Khaki) fits a long roof up to 124 inches. The Gardelle fabric won't shrink or stretch and the reflective piping for enhanced visibility in low light. Doors and windows roll open and secure with rip-n-grip straps. 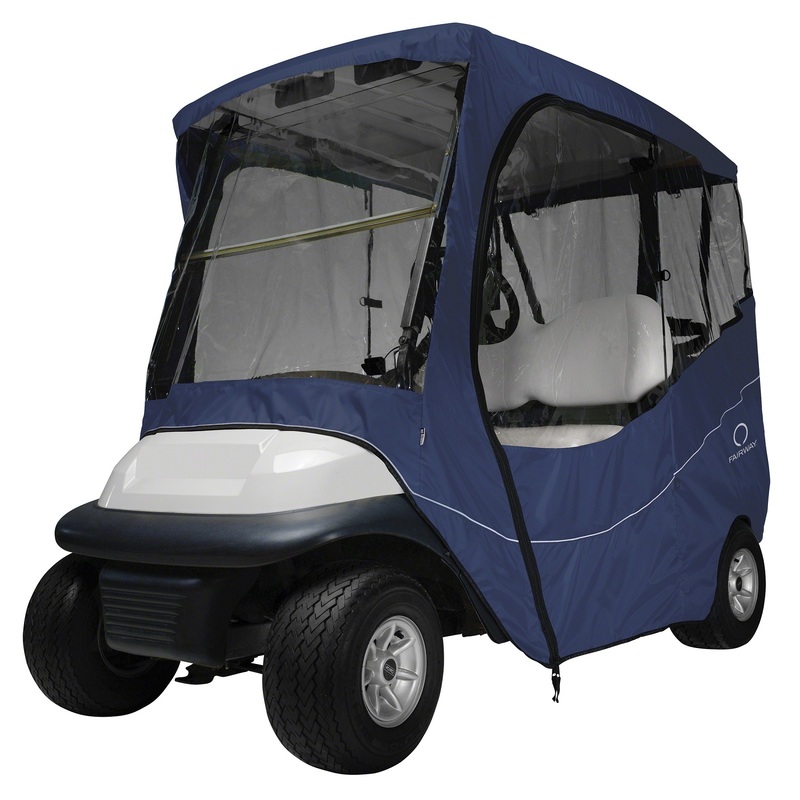 With a quick zip off windshield and zippered doors and panels adjust quickly and easily to any weather condition. Interior and exterior zipper pulls make for a quick and easy access. The convenient carry duffle bag with padded handles makes an easy transport just a zip away. And because it can double as a Storage Cover during the off season, this Enclosure really makes itself useful year - round. Whether you are seeking protection from unguided golf balls or inclement weather, the Fairway Deluxe Enclosure (Khaki) fits a short roof up to 68 inches. The Gardelle fabric won't shrink or stretch and the reflective piping for enhanced visibility in low light. Doors and windows roll open and secure with rip-n-grip straps. 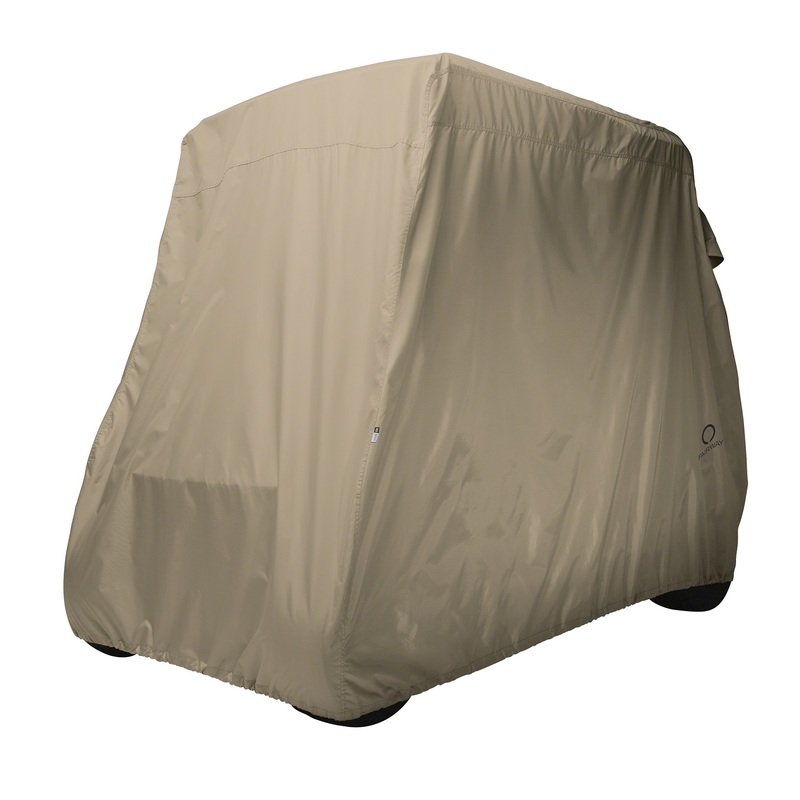 With a quick zip off windshield and zippered doors and panels adjust quickly and easily to any weather condition. Interior and exterior zipper pulls make for a quick and easy access. The convenient carry duffle bag with padded handles makes an easy transport just a zip away. And because it can double as a Storage Cover during the off season, this Enclosure really makes itself useful year - round. Whether you are seeking protection from unguided golf balls or inclement weather, the Fairway Deluxe Enclosure (Black) fits a short roof up to 68 inches. The Gardelle fabric won't shrink or stretch and the reflective piping for enhanced visibility in low light. Doors and windows roll open and secure with rip-n-grip straps. 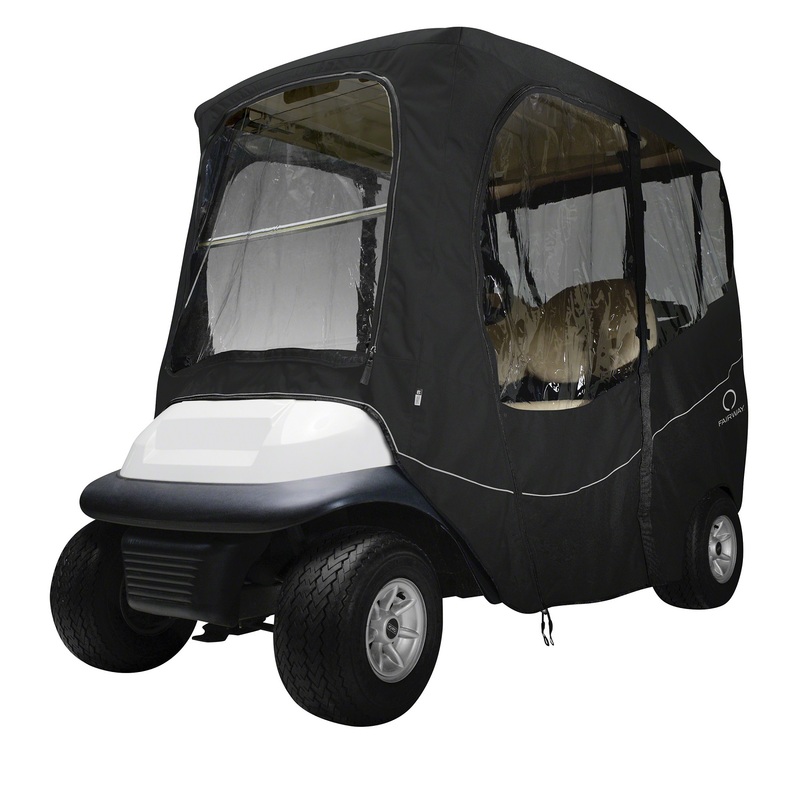 With a quick zip off windshield and zippered doors and panels adjust quickly and easily to any weather condition. Interior and exterior zipper pulls make for a quick and easy access. The convenient carry duffle bag with padded handles makes an easy transport just a zip away. And because it can double as a Storage Cover during the off season, this Enclosure really makes itself useful year - round. Whether you are seeking protection from unguided golf balls or inclement weather, the Fairway Deluxe Enclosure (Black) fits a long roof up to 80 inches. The Gardelle fabric won't shrink or stretch and the reflective piping for enhanced visibility in low light. Doors and windows roll open and secure with rip-n-grip straps. 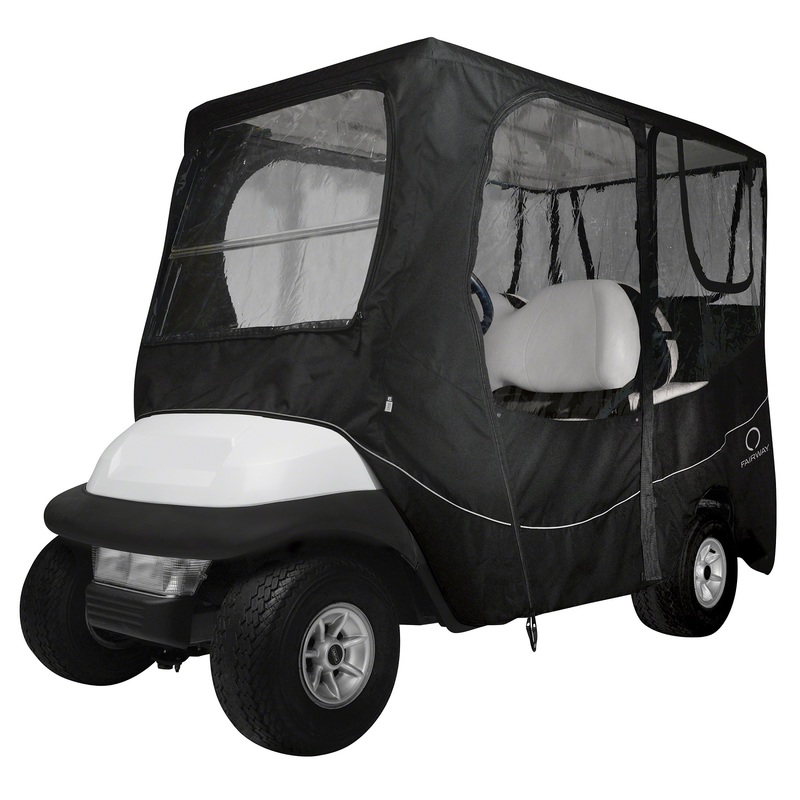 With a quick zip off windshield and zippered doors and panels adjust quickly and easily to any weather condition. Interior and exterior zipper pulls make for a quick and easy access. The convenient carry duffle bag with padded handles makes an easy transport just a zip away. And because it can double as a Storage Cover during the off season, this Enclosure really makes itself useful year - round. 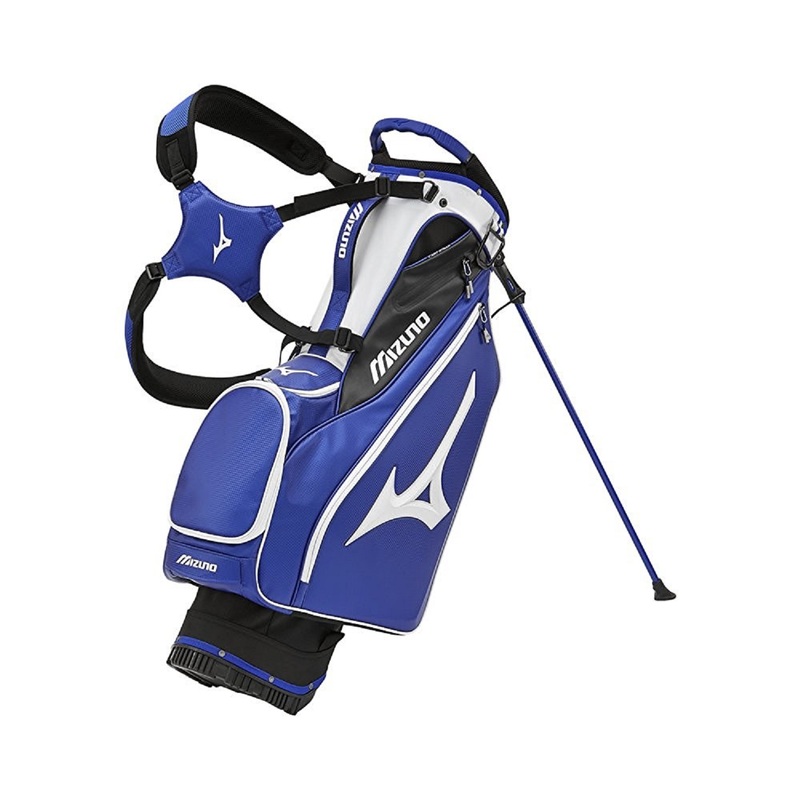 You might not find the fairway on every shot, but this Fairway Golf Stand Bag will make your round a whole lot better. This lightweight bag won't weigh you down when you walk 18 holes, but it's still loaded with features. 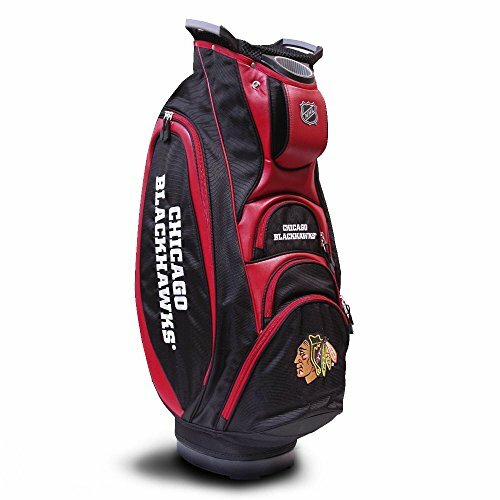 The 14 way divider provides easy club organization, five zippered pockets offer plenty of storage space for tees and balls, and a cooler pocket keeps your beverage ice cold on a hot summer day. With team logos embroidered in six locations, there is no denying you're a fan.